“Le Papillon et la fleur” … was my very first piece, composed in the school dining hall amid the smells from the kitchen … and my first interpreter was Saint-Saëns. Thus the 78-year-old Fauré, looking back over 56 years to his schooldays at Paris’s newly founded Niedermeyer School of Classical and Religious Music. Fauré boarded for eleven years at the school, where he received an education that was in some ways radically conservative (with Gregorian chant and Renaissance polyphony as constants) and in some ways uniquely up-to-date (with the ardent young Camille Saint-Saëns introducing the boys to the latest music of Liszt and Wagner). The mixture goes far to explain why, when he became known as a composer, Fauré was thought of as a disruptively extreme progressive — though it may be difficult now for us to see how his music could have shocked anyone. Much of what was thought jarringly new in Fauré was in fact antique: he based many of his harmonic procedures on the 16th-century polyphony that had largely formed his taste. Thanks to the early-music movement, our ears are more accustomed than our great-grandparents’ were to the sonorities of Renaissance music. Connoisseurship of the very old and the very new made the young Niedermeyer-trained disciple of Saint-Saëns drastically unlike the typical product of the state-run Paris Conservatory, whose musical beau ideal was an attractive, if rather superficial, sort of opera. When Fauré was 22, he visited Liszt in Germany, showed new compositions to him, heard him conduct Saint-Saëns’s Samson et Delilah, saw eight Wagner operas — and then came home to resume his routine daily work as a church organist and teacher. Fauré may have been surprised to find himself in the very vanguard of the avant-garde, but he was in fact the first composer to penetrate the circle around that great nurturer of modernism in the arts, the Princesse de Polignac (formerly “Winnie” Singer, the sewing-machine heiress, who would later be patron to such as Stravinsky and Kurt Weill). 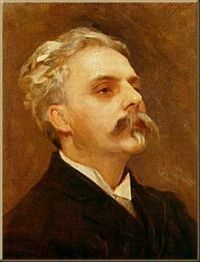 Fauré differed from his colleagues and contemporaries in several ways; among them are his complete immunity to the prevailing worship of Wagner, his horror of elaborate orchestration that might disguise lack of musical invention, and a consequent preference for simple, straightforward musical forces. The song with piano, in fact, presents Fauré at his best. There were of course distinguished precedents for the piano-accompanied art-song, and it is particularly instructive to contrast Fauré’s style with that of Schubert’s Lieder. In a Schubert song the vocal melody almost has a life of its own, often so strong that practically any reasonable accompaniment would leave its qualities intact. Schubert’s glory was to create a piano part that was itself so substantial as to carry the song into a completely new realm. It is not just that the piano became an equal partner with the voice. In different ways in different songs — whether the piano participates in the poetry by suggestion the spinning of a wheel or the rippling of a brook, or simply by joining the voice in highlighting atmospheric declamation — Schubert breaks down expressive barriers between the two performers. They may be utterly at one in their expressive purpose, but in terms of musical tasks they remain distinct. The approach that Fauré gradually developed was very different. His characteristic vocal part cannot be separated from the piano part without losing its very reason for being. The singer’s line grows out of the harmonies — harmony giving birth to melody, rather than completing an effect initiated by melody. Not only expressive but formal boundaries tend to break down. If it is accidental, it is also rather poetic that, having written his first song in 1869 under the tutelage of Saint-Saëns, Fauré wrote his last song in the year of his old master’s death in 1921. Since he was himself to die in 1924, the younger composer’s whole career is marked with the cultivation of his mélodies. The student efforts owed something to Mendelssohn and Gounod, while the mature subtleties appropriate to Verlaine’s verses were gems shown off by the potent Princesse in her modernist salon. But Fauré remains loyal to principle throughout: he avoids texts that contain any conspicuously colorful verbal description or that might tempt him to devise specifically pictorial music. He is interested not in the striking detail but in an overall integrity and aptness of effect, and the only cleverness he will allow himself is of the least distracting kind (like using the Lydian mode in “Lydia”). His strategy is working in the long haul. His music steadily wins greater understanding and appreciation; and his career is a strong argument for enjoying one’s daily life (for he was a notable bon vivant) while fixedly sticking to one’s principles. Eric Blom once wrote that “for a cultivated and serious minority his music will remain a precious possession.” May that minority only increase!